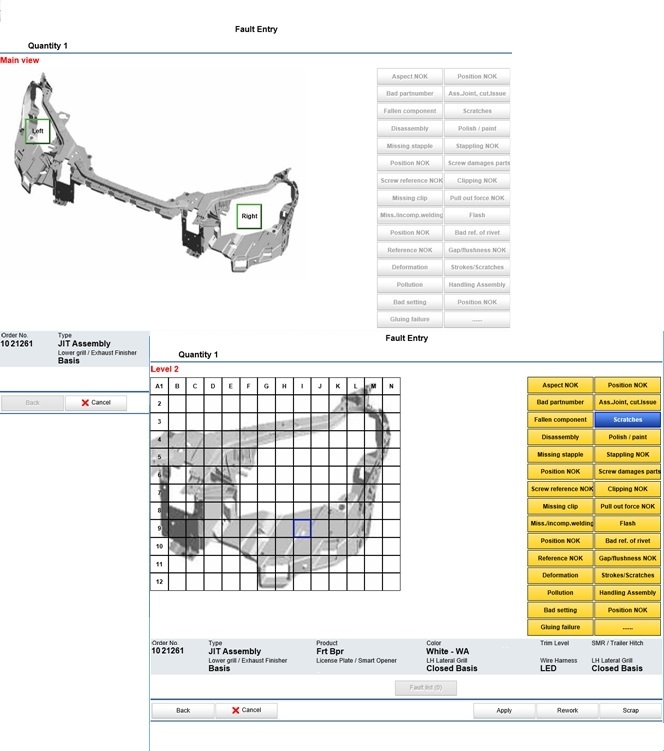 Cosmino MES Plus controls the production process for each variant of a component or item via the Cosmino ManufacturingManager module (link). The software thus ensures smooth and fault-free assembly and processing. Especially in variant manufacturing and in multilevel and non-linear work stages, the MES keeps an overview of the quality, variant and correct sequence. Via this module, Cosmino MES Plus also controls further transport between work stations and the processing in production cells and on machines. Cosmino ManufacturingManager supports manual processing and assembly with instructions, images and videos in the workplace. Its major advantage is that the defined processes are not programmed but merely configured. The software solution can be freely upgraded in case of changed or new production processes. A workflow is defined for all variants. This determines which operations are carried out in which workplace. Optional workplaces are also available, which must each be controlled e.g. according to the item or quality. It also determines which operations must be carried out in manual workplaces and machines. These could be many consecutive operations in an assembly workplace. Through defined logics and communication with tools and pick-to-light systems, the correct sequence and execution is ensured. The manufacturing orders for each line are sequenced from the ERP or loaded from a just-in-sequence system. Cosmino MES Plus also manages the variant code with the options related to variant control (material, color, segment-specific requirements, etc.). The processing or assembly of a component differs from variant to variant. Cosmino MES Plus coordinates production with regard to sequence synchronicity and product differentiation. Components or items are clearly identified at each workplace and each machining center. This guarantees one hundred percent traceability (Cosmino Traceablity) and introduces variant-dependent processing by Cosmino MES Plus. Along with communication with machines and tools, Cosmino MES Plus also assists people involved in the manufacturing process with the correct processing and assembly depending on the variant. 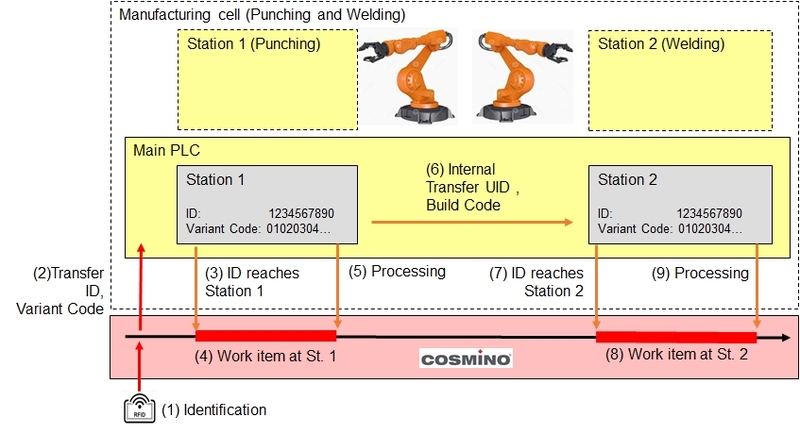 For this purpose, an information system with worker guidance is displayed via the Cosmino online dialog (Cosmino WorkerPoint). The tasks to be carried out at the workplace are visualized for the employee with texts, documents, images or videos one after the other. Cosmino MES Plus releases e.g. tools and pick-to-light systems and verifies the correct use based on process parameters. In consideration of the stored configuration, Cosmino checks whether an operation has been carried out properly. Only then is the next stage released. A manual mode is possible if no linkage to assembly tools is intended. Based on the current status of a component, further transport is coordinated by controlling the transport system (e.g. overhead conveyor, driverless transport system, DTS, AGV, etc.). The traditional MES functions are also supported by this highly modern Industry 4.0 solution: materials, machine statuses, causes of downtimes, etc. and especially product quality are recorded with the Cosmino online dialog. If a component is marked as “not_okay”, further processing is blocked and the item can be entered into the additional reworking station. Each workplace or each individual component has its own digital twin. The autonomous and intelligent function module pre-processes recorded data locally before filing them in the MES database. Data storage with buffering takes place near the production process or even on the component (RFID chip or similar).